Risk Factors: steriod injection into the tendon shealth or retrocalcaneal bursa, ciprofloxacin/fluoroquinolones use, type O blood, male gender, gout, hyperthyroidism, renal insufficiency, arteriosclerosis (Paavola M, Foot Ankle Clin 2002;7:501). Pop or snap in posterior ankle with acute pain usually associated with sudden push-off movement during sporting activity, generally in middle aged patient. Palpable defect in Achilles usually 2-4 cm above calcaneous. Thompson sign = squeeze calf muscle with pt prone, feet extended off end of table. The foot plantar flexes if tendon is intact. No foot movement = ruptured Achilles. (Thompson TC, J Trauma 1962:2:126). Hyperdorsiflexion sign: with patient prone and both knee flexed 90º, maximal passive dorsiflexion demonstrates increased dorsiflexion on injured side. Repetitive heel rises: patient with a torn Achilles will not be able to perform repetitive heel rises. Resting equines: ankle is normally in 7-12º of equinus when laying prone at rest. Loss of normal resting equinus position indicates Achilles rupture. MRI has been shown to be sensitive and specific, but is no better then physical exam. Disrupted tendon is best seen on T1 weighted images. Ultrasound: is useful in the diagnosis, provided skilled operator is available. 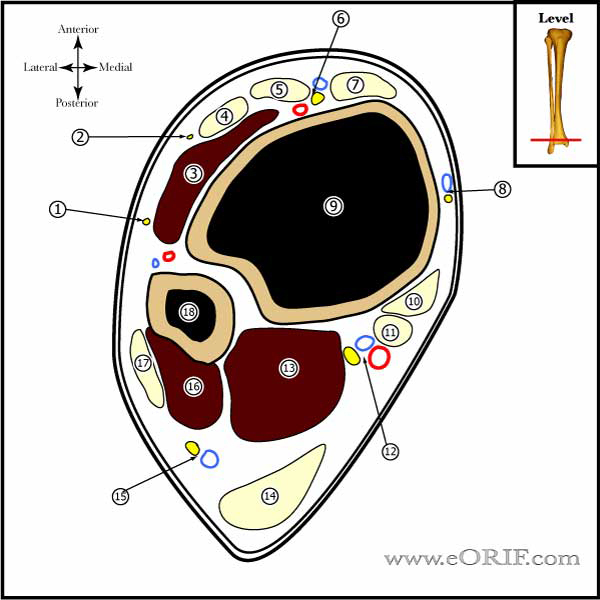 Useful for determining tendon end location if considering non-op treatment. Ruptured area is hypoechogenic on ultrasound. (Hufner TM, Foot Ankle Int 2006;27:167). Initial treatment: short leg splinting in plantar flexion. Surgical and nonsurgical rx give simlar long-term outcomes. Nonsurgical treatmentrequires immobilization for 8-12 wks Disadvantages: higher recurrence rate(15.2%), higher percentage of dissatisfied patients, significant loss of power, strength and endurance compared to surgical treatment. Monitoring with Ultrasound or MRI recommended to confirm apposition of the tendon ends. Benefits: lack scar, no wound complications, less expensive. Indicated for lower demand older pt, pts on systemic steroids/methotrexate, IDDM, vascular compromise. Chronic ruptures / defect >2cm-- transfer of the flexor hallucis longus (release at the knot of Henry) through the calcaneus. (Wilcox, DK Foot Ankle Int 2000;21:1004) with concomitant V-Y advancement of the gastrocnemius. V-Y advancement can fill a defect of 2 cm to 5 cm. Flexor digitorum longus transfer, fascia lata transfer, gracilis transfer are also a viable alternative. (Wilcox DK, Foot Ankle Int. 2000 Dec;21(12):1004). 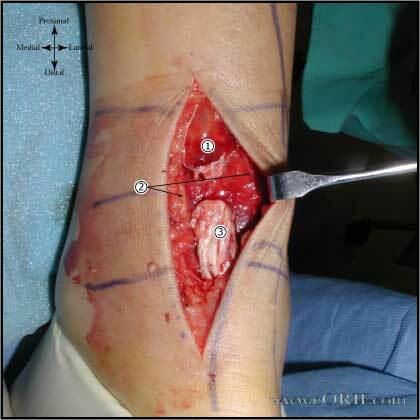 Achilles Avulsion from the Calcaneous: direct repair to bone with transosseous sutures or suture anchors. Weight-bearing short leg cast with the foot in a gravity equinus position for 8 weeks. Cast removed at 8 weeks. Start 2.5cm heel lift and gastric stretching / strengthening. 10 day f/u, casted at 20º flexion, NWB; Consider functional boot with heel wedge. Consider early weight bearing if repair and tissues are adequate. 6-8wks; 1” heel lift, begin active physical therapy:passive stretching, active theraband. Heel lift continued until able to reach 10 degrees of dorsiflexion. Wilcox DK, Bohay DR, Anderson JG. Treatment of chronic Achilles tendon disorders with flexor hallucis longus tendon transfer/augmentation. Foot Ankle Int. 2000 Dec;21(12):1004-10.